If you’re looking for holiday presents for the makeup mavens in your life, a brush set can never be a bad idea. Who wouldn’t love a fresh set of tools? But while that’s an easy decision, what’s trickier is finding a quality set worthy of those special women that doesn’t cost the Earth. Not prepared to splash out on the super pricey brushes those celebrity makeup artists recommend? Then here are five sets that will lift your girls’ holiday spirits way up, without bringing your bank balance way down. 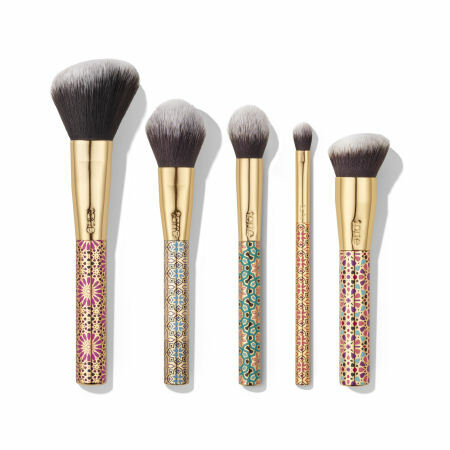 These five vegan brushes with lattice-pattern handles sit in a gilded mosaic holder. We love the Moroccan vibe of this set…so different! The ultra-plush eye shadow, highlighter, face powder, blush, and foundation brushes will bring out the user’s inner sparkle well into the new year. Our favorite is the perfectly dome-shaped powder brush; it offers flawless application. You’ll find this set at BeautyBrands.com. These five Heavenly Luxe, cruelty-free brushes practically beg to be wrapped up — what with their silver ombré handles that lend a festive feel. 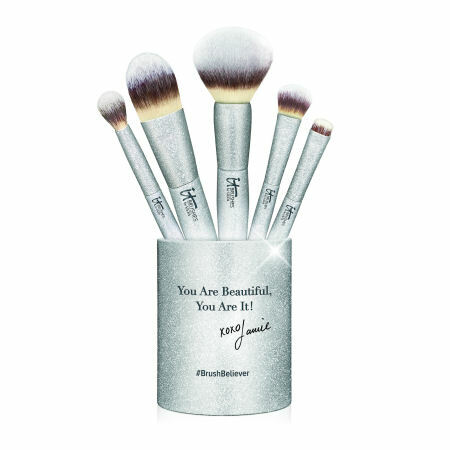 The kit includes a full-size powder, foundation, eyeshadow, crease, and liner/brow brush housed in an adorable shimmering cup with this encouraging message to your giftee: “You are Beautiful. 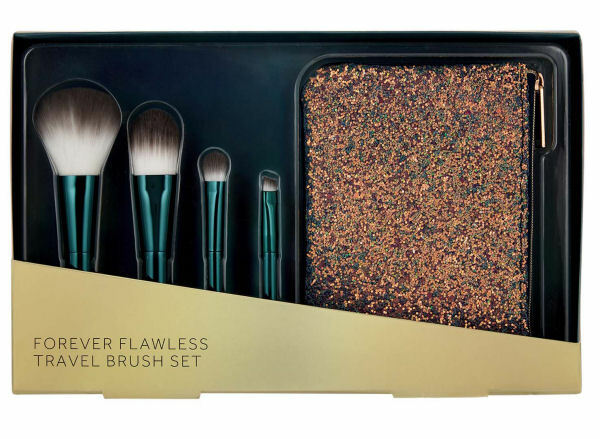 You are It!” This limited-edition set is made especially for ULTA. Do you have someone on your list that only just started wearing makeup? We wouldn’t ante up for Kevyn Aucoin brushes for a 14-year-old, either. 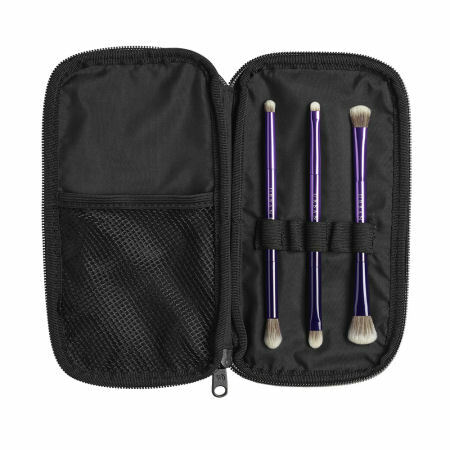 Here’s what to pick up instead: this set of purse-size basics: a powder/blush brush, foundation brush, eyeshadow brush, and an angled fine liner brush. Foundation can be the trickiest thing for newbies to get right, so good thing this foundation brush evenly blends just the right amount. That, and the prismatic pouch, is what will elevate you to #bestauntever status. It’s sold exclusively at Walgreens stores and Walgreens.com. She’ll have a twinkle in her eye every time she turns to this professional quality kit. She gets the double-ended tapered crease brush/smoky smudger brush, the detailed tightline brush/shadow brush, and the blending brush/large blending brush. If she loves all things eco-friendly, you’ll get bonus points for this prezzie: the super-soft synthetic hair is made from recycled plastic bottles! Her look will be easy on the eyes and the planet. Available at Ulta stores and Ulta.com, select Macy’s stores and Macys.com and Urbandecay.com. 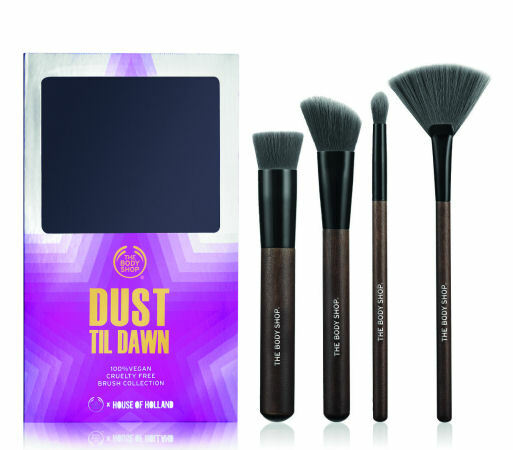 In a collaboration with UK edgy-fashion favorite House of Holland, The Body Shop has launched the capsule Dust Til Dawn brush set for this holiday season. The wood in the Foundation Buffing Brush, Eye Shadow Blending Brush, Angled Blush Brush, and Fan Brush is sustainably sourced. These brushes add a bit of luxe to her everyday beauty routine. You can snag this one at The Body Shop stores and Thebodyshop-usa.com. Now that you have amazing, budget-friendly brush sets to pick from, you can check your sister, best friends, niece, even your MIL, off your holiday gift list. That’s a wrap!